As we go out into the Bay, more and more vessels and landmarks become visible. On clear days, the skyscrapers in San Francisco are visible, as are Alcatraz , the Golden Gate bridge, various radio towers, Mount Tamalpais, etc. Think of the many professions and activities represented on the Bay, and how they reflect on the Bay as an economic, ecological and cultural region: tug operators, water taxis, ferries, sightseeing boats, charter boats (both power and sail), fishermen, the Baykeeper and his staff, Coast Guard, Navy, Vessel Assist, boat bottom cleaners, pilot boats, boat salesmen, sailmakers, boatyards, nature conservators, marine biologists of all kinds working for both environmental organizations and for corporations. Ocean water enters the Bay through the Golden Gate. 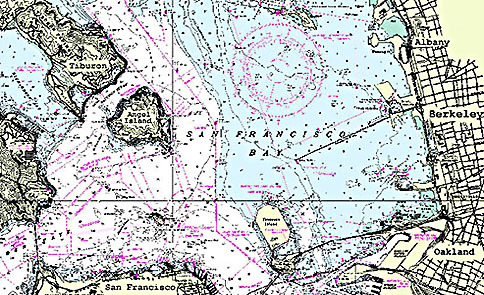 The deepest part of the Bay is right under the Golden Gate Bridge, with 330 feet of water. Other parts can be as shallow as 7 feet, making it necessary to know when the next ebb (low water) or flood (high water) is due to occur. Also, regular dredging of the shipping channels is necessary, so that all the big container ships and oil tankers coming into the Bay do not run aground. The gravitational force acting on all objects on Earth, winds and the spinning of Earth around its own axis cause large bodies of water to move in certain, well-known directions. These horizontal movements of water are called currents. Tides are the relative high and low water levels. Twice a day, water leaves the Bay (ebb), and roughly six hours later it returns (flood). These four distinct stages are repeated everyday during the moon’s 24 hour orbit around the Earth. 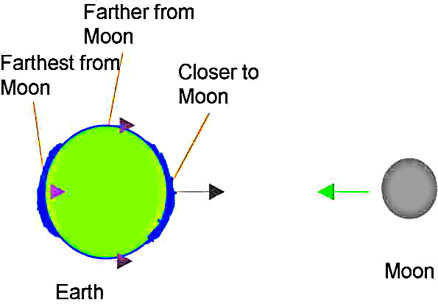 The movement of water is caused by the relative gravitational pull acting between Moon, Sun and Earth, literally pulling water away from its location on Earth. and ship captains to be sure they have enough vertical clearance for their ships to pass safely under bridges. We also get close to another East Bay landmark, the Berkeley Pier. It extends 3,000 feet into the waters of the Bay. Its original length of three miles designates the extent of the planned landfill in the East Bay. Fortunately for humans and sealife alike, the Save San Francisco Bay Association under the leadership of Sylvia McLaughlin managed, in 1969, to stop the Army Corps of Engineer’s plan to fill in 2,000 acres of open water by the year 2020. Historically, the politics surrounding the Pier have always been difficult. 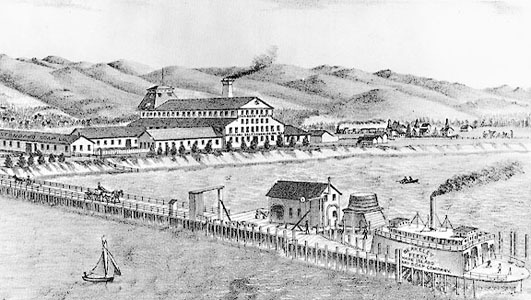 Berkeley’s first pier, Jacob’s Landing, was built in 1853 by Captain James Jacobs, an immigrant from Denmark who transported freight between San Francisco, Sacramento and other shoreline communities. In 1874, a small municipal pier was built to provide a short-lived ferry service to San Francisco. Both of these piers are have now been covered by landfill and the remains are located under University Avenue. In 1926, the Golden Gate Ferry Company built another pier which allowed motorists to drive directly from University Avenue, three miles into the Bay and take a car ferry to San Francisco. This service was so popular that police reportedly encouraged drivers to maintains speeds of 60 miles per hour on the pier in order to keep the ferries full. It now belongs to the City of Berkeley. As it slowly rots, opinions are divided as to what to do with it. On the one hand, the logs coming slowly undone in the continuous onslaught of earthquakes, currents, and wind constitute a hazard to pleasure and commercial craft. On the other hand, fish, mussels, crabs and other marine animals and plants have started colonizing this artificial reef and contribute to the variety of biological species found in the Bay. To most humans, who use it for walking and fishing, it is merely a marker of a historical era when ferries were the main mode of transport across the Bay, before most of the major Bay bridges were built. The perpetual car traffic on nearby freeways is a reminder of a more pressing contemporary concern: people fishing off the Pier as well as fishermen in other parts of the Bay have to contend with fish stocks affected by toxins, resulting in mutations and depleted stocks. What famous buildings and landmarks can you see? Why is part of the Berkeley Pier falling down? Do you think it should be left to fall down, or removed? What do most people do on the Berkeley Pier?